There is a theory that extraterrestrials came to earth during the Aztec and Mayan empires and these extraterrestrials were actually called ancient astronauts. It is said that they came and helped created the civilization we have today. It is also said that they helped build the Great Pyramid, Stonehenge, Easter Island and a few other major land marks. There is one man, Erich von Daniken, who is a Swiss author who wrote quite a few books about these ancient astronauts. There is an entire chapter on this in the book Flim Flam as well is anyone wanted to further look into it but Daniken also has a few claims in his books that grabbed the public's attention but are completely ridiculous. Daniken claims that these "beings from outer space visited earth many times in the past, they mated with primitive people here, such visits are recorded in mythology and history and artifacts have been left behind that prove these visits." (Randi, 1982) But there are many critics who say that Daniken has no factual evidence or anything to base his claims off of. 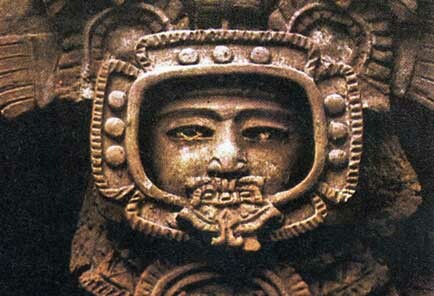 Here are a few pictures of what is to be believed as an "Ancient Astronaut"